The youngest of four children from Long Island, New York, Kenny Ford was born into a musical family. By the age of three, Kenny was already sitting at the piano figuring out melodies by ear of songs he had heard around the house. People have asked his parents and siblings if they forced him to practice piano, as is the case with many other young children. "Actually," recalls his sister Joy, "We had to drag him away! He'd be down there at 6:00 AM banging away and waking up the whole house!" It became apparent that music was his destiny. Kenny furthered his studies in music attending the prestigious Berklee College of Music in Boston, MA, where he completed his Bachelor of Music. It wasn't long before Kenny came to the attention of Hank Lane Music, joining the Harris Lane Band as the group's keyboard player and vocalist. As the band's Musical Director, Kenny was able to further fine-tune his skills. Harris soon recognized Kenny's potential to become a bandleader for the company. 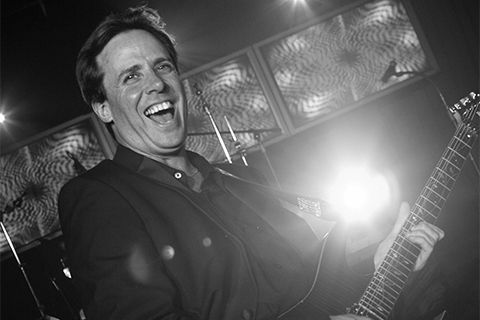 Kenny has been leading his own Kenny Ford Band for the past 15 years receiving client accolades all along the way. Kenny’s approach is that he treats each party as if he were playing for a close personal friend. The results speak for themselves. Today, the Kenny Ford Band is one of the busiest on the Hank Lane Music roster. Please forgive the delay in writing you, as I was catapulted back to work! I did not want too much time to go by before telling you and the Kenny Ford Band how absolutely thrilled we were with the music they provided, NON-STOP, throughout our daughter’s wedding (Michelle and Adam) on October 22,2011 at Temple Emanuel in Closter, NJ. Guests are still talking about the band. It was truly sensational and well beyond our expectations! We have quite a few friends who are musicians and they gave the band the highest kudos. People danced through the breaks, people danced to the bitter end. The Kenny Ford Band is to be credited with playing a major role in making this a most memorable wedding. Thank you! Thank you! Marisa and I just wanted to quickly thank you two (and Hank Lane, in general) for everything. You two, specifically, were super professional, always available, and enjoyable to work with – we couldn’t have asked for more. Please send our thanks (again) to the Kenny Ford Band. They were ABSOLUTELY AMAZING. Everyone is still talking about them and telling us how well they were (as if we didn’t know). A lot of people, independently of each other, actually told us that they thought we had a DJ because of how on-point they were with every single note, across all genres of songs. Although we had very high expectations going into it, they managed to somehow shatter them. We really don’t have any words to say about them, except they were the best we have ever heard. Without question. Finally, to the Hank Lane Company, in general, we also want to say thanks. If you two and the Kenny Ford Band are representative of the organization as a whole, it surely must be the best in the area. We visited with several different music groups/companies and never once did we second guess our decision to work with you…even till now, after the wedding. We have been and will continue to tell all of our friends and family (most of whom have been asking us anyway) to choose Hank Lane. Thank you again for making our evening so special and AWESOME. We loved working with Hank Lane for our wedding!! We used the Kenny Ford band - they were incredible!!! They kept the party going all night. When the wedding was over, our dance floor was still packed and people did not want to leave!! Leading up to the wedding, they were super easy to work with and extremely responsive over email. I would book them again and again!! !